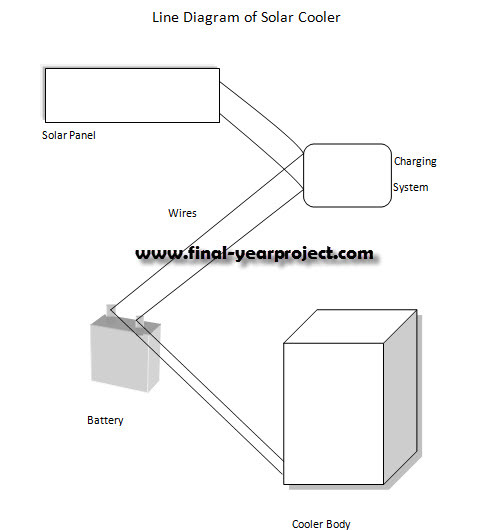 This is a good Mechanical final year project on Solar Cooler and was submitted in the partial fulfillment of degree of bachelor of Technology in Mechanical engineering. This project “Solar Cooler” is based on the concept of harvesting solar energy. As it is easily interpretable from the name of the project that it is based on the solar energy for satisfying its need of power source. The functionality of Solar Cooler is dissimilar as that of the traditional coolers. You can also Subscribe to FINAL YEAR PROJECT'S by Email for more such projects and seminar. The solar energy is harvested and stored in a battery. This battery is in turn connected to the solar cooler for the power source. Then the water flows downwards from the higher potential towards cooler grass and cotton. The cooler grass and the cotton soaks the water and makes the air cool; even if the potential of water get lower it does not create any kind of hindrance in the smooth working of the solar cooler. Use this project for your reference and study only.